Re: Russia Negotiating Military Deal with PHL ? Russian Ambassador to the Philippines Igor Khovaev on Tuesday assured that his country is ready to be a reliable friend and partner of the Philippines but noted that it is not seeking to establish a military alliance with any country within the Asia-Pacific region. "We are open for cooperation with all responsible members of the international community, including the Philippines," Khovaev said in a forum in Quezon City on Tuesday. "[But] we are not talking about alliance.... We are talking about partnership and friendship. Russia has no military alliance in the Asia-Pacific region. We are not going to create any military alliance," he added. However, he said Russia does not want to meddle with the issue on the disputed territories in the South China Sea. "Russia does not take sides in [South] China Sea [issue]. It must be solved in compliance with international law," Khovaev said. Abella said that the Memorandum of Understanding will provide the framework for engagement between Filipino and Russian troops. "[That will include] military to military, visiting students, mutual exchanges, and joint military exercises," Abella said. Philippine and Russian defense officials met in Moscow in April 2016 to discuss possible areas of cooperation, the Department of Foreign Affairs said last May. Among the issues discussed was the planned Philippine-Russia Memorandum of Understanding on Defense Cooperation. 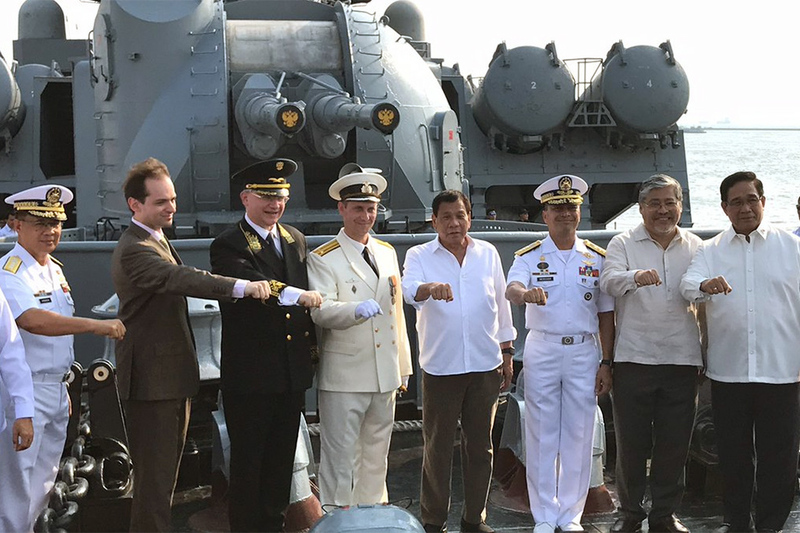 WASHINGTON – Any bilateral defense ties between the Philippines and Russia will not affect how the United States views the importance of its bilateral relationship with the Philippines, a long time ally, State Department spokesman John Kirby said. “Our overall mil-to-mil relations remain robust, they remain multifaceted and that’s the way we want to see it continue,” Kirby added. MANILA, Jan. 31 (PNA) -- In line with the government’s thrust to enhance security cooperation with Russia, Philippine Ambassador to the Russian Federation Carlos D. Sorreta met with Lt. Gen. Alexander Avdeyko, Head of the Legal and Treaties Department of the Ministry of the Interior (MoI), in Moscow, the Department of Foreign Affairs said on Tuesday. The two officials acknowledged the necessity of consolidating efforts in combating the growing threat of transnational crimes, especially drug trafficking, terrorism, and human trafficking, among others. “The Philippines recognizes the Russian Federation as an important partner in advancing its national security goals, including in its fight against transnational crimes and other public safety and public order issues,” Ambassador Sorreta said. “For this reason, we are keen on establishing institutional linkages between the Department of Interior and Local Government and other Philippine security agencies and the MoI in order to facilitate cooperation in this sphere,” the Ambassador added. Lt.Gen. Avdeyko noted that Philippines-Russia relations are on the rise based on the high-level contacts at the head of state and ministerial levels, and the expanding tourism exchanges. The MoI expressed its desire to contribute to this positive development as it is prepared to become a full-fledged partner in the fight against crime through capacity building activities. These activities possibly include training and retraining of Philippine personnel in the MoI’s institutes and academies as well as cultural and sports exchanges, among others. Sorreta affirmed that bilateral cooperation is indeed on the rise and that both Presidents Rodrigo Roa Duterte and Vladimir Putin are determined to strengthen Philippine-Russia relations even more. National Security Adviser Hermogenes Esperon, Friday (April 21) said that the defense cooperation between the Philippines and Russia would be in the form of training. 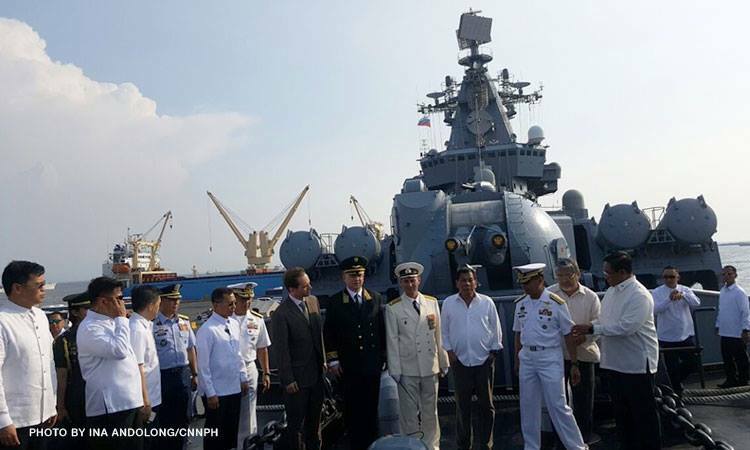 Esperon, in an interview after the President’s visit to the Russian guarded missile cruiser Varyag, said details about the said cooperation will be finalized during President Duterte’s visit to Moscow next month. “Defense cooperation would come in the form of training. Probably some exchange of information,” he said. According to Esperon, Duterte visited the said ship, which is docked in Port Area, Manila, as a sign of good will after the President received an invitation. “The visit of the president is also a show of good will no more, no less. It’s also our time to extend an invitation for them to come again. Which he did,” he said. Putin was not in Moscow on Tuesday but decided to return to Kremlin to meet President Duterte before his trip back to Manila. “As you probably know, I spent this day away from Moscow in one of our regions. And that I have seized the chance to see you in person,” Putin said. “My colleagues and myself definitely understand quite well that you do have to come back to return to your motherland,” he added. “And let me express hope that the conflict that you have just mentioned will be resolved as soon as possible and with minimal losses and casualties,” Putin said. He also assured that the full package of bilateral documents will be signed, including the package on defense cooperation. “That’s one of the plans because we are converting the area of the Government Arsenal in Limay, Bataan, which consists of 300 hectares and we are trying to develop that,” Department of National Defense Secretary Delfin Lorenzana told Philippine News Agency in a recent interview. “There is now a bill in Congress, they have already been deliberating it to convert that it into a defense manufacturing complex that will involve other locators from other countries,” added Lorenzana. The Government Arsenal is an agency under the DND responsible for the production of basic weaponry and ammunition for the Armed Forces of the Philippines, and the Philippine National Police, among other law enforcement agencies. It is also into the sale and export of products in excess of military and police requirements. “That’s why they’re very interested to deal with us through military relationship so that they can have this road into the ASEAN,” added Lorenzana. For sniper rifles, this is the only one that makes sense IMO. The Philippines may soon source military equipment from Russia given the improved trading relations between the two countries, the Department of Trade and Industry (DTI) announced Monday. "We will look into how we can have a cooperation in the field of how we can supply 'yung mga military equipment. Russia is recognized to be good suppliers of that," Trade Secretary Ramon M. Lopez told reporters in Pasay City. Left Photo: Defense Undersecretary Raymundo DV Elefante (left) is welcomed by Russian Deputy Defense Minister Alexander Fomin to the International Military and Technical Forum or “Army 2017” in Moscow. Right Photo: The Philippine Delegation composed of officials from the Department of National Defense and the Armed Forces of the Philippines examining Russian military equipment at Army 2017. Photo by L. Camoying. 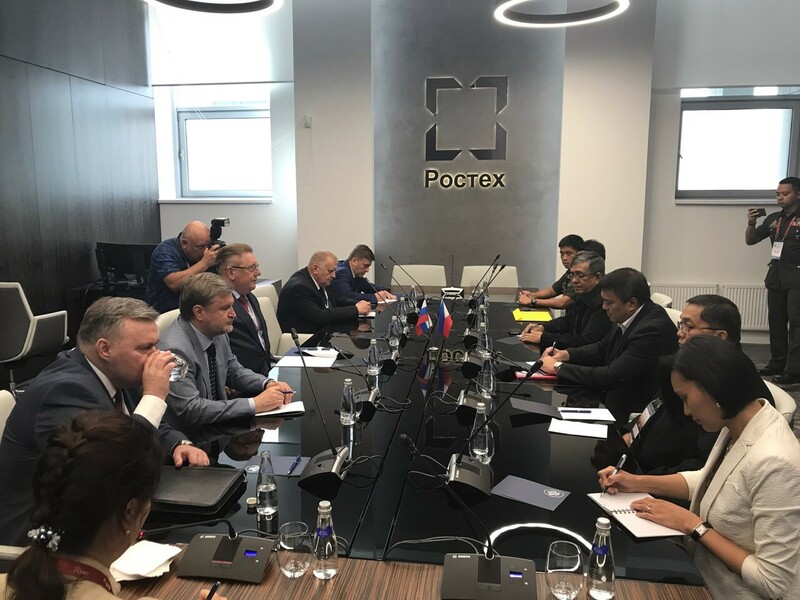 The Philippine Delegation led by Defense Undersecretary Raymundo DV Elefante (right) holding talks with Rosoboron export officials on the possibility of procuring military equipment from Russia. Photo by J. Valdez. This was the first time that the Philippine Army observed a military exercise in Russia in 41 years of Philippines-Russia relations. “The Philippine Army’s participation as observer in Zapad-2017 was an excellent opportunity for to see the Russian Armed Forces’ combat capabilities and military hardware in action. This is just the beginning of what we expect to be a robust army-to-army engagement in the years to come,” Philippine Ambassador to Russia Carlos D. Sorreta commented. Zapad is a regular exercise conducted every four years. This year’s edition ran from September 14 to 20 in various testing grounds in Russia’s Western Military District and in Belarus. 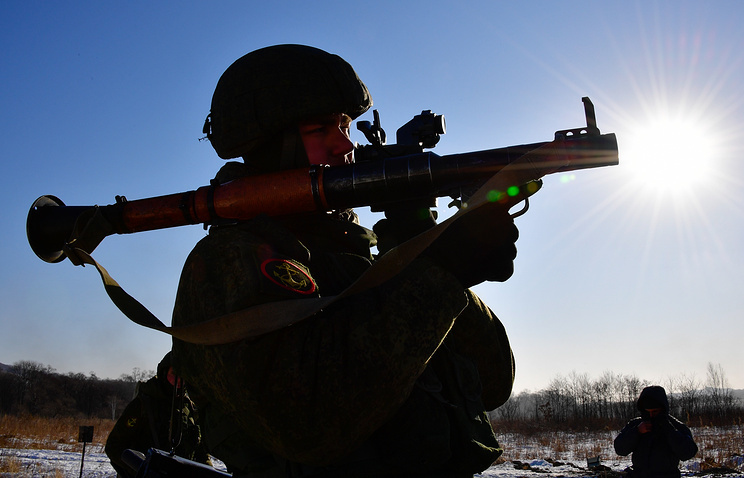 The overall objective is to enhance combat readiness and interoperability of the Russian and Belarusian Armed Forces. SAN MIGUEL, Bulacan - Russia is set to give the Philippines brand new firearms to boost the military arsenal, President Rodrigo Duterte bared Wednesday in yet another indication of warming ties between Manila and Moscow. Duterte said the Russian government had wanted to keep the donation under wraps, but he announced it nonetheless saying the public would eventually know about it. “We expect the arms to come in. It’s useless in keeping it a secret. If they dock the ships there, magtatanong talaga iyan kung ano ang dinidiskarga,” Duterte said in a speech during the groundbreaking of a military housing site here. Defense Secretary Delfin Lorenzana said the Russian donation, set to arrive on Oct. 22, is composed of 5,000 Kalashnikov rifles with about a million rounds of ammunition, and 20 military trucks. “Hindi pa natin alam ang worth pero substantial na bigay iyan. Grant iyan, at no cost. Gusto tumulong ng Russia to fight terrorism kasi sila din is also fighting terrorism sa bansa nila,” Lorenzana told reporters. Lorenzana said Moscow would hand over the donation without conditions. The defense chief added that while the Philippines and Russia have yet to enter a defense cooperation agreement, Moscow is willing to accept small military contingents from Manila to observe Russian military exercises. President Rodrigo Duterte on Wednesday received thousands of assault rifles, 20 military trucks, bullets and helmets donated by the Russian government to the Philippines, which would be used in the country’s fight against terrorism. Duterte, together with Defense Secretary Delfin Lorenzana, toured the Russian anti-submarine ship Pantaleev docked at the port of Manila. The President witnessed the signing of certificate of turnover of military equipment to the Armed Forces of the Philippines (AFP). Military equipment donated by Russia included 5,000 AK-74M Kalashnikov assault rifles, one-million rounds of ammunition, 20 army trucks, and 5,000 steel helmets. News articles are reporting AK-74s, but those look like AKMs from the angled muzzle brakes, lack of lightening cuts on the stock, and the curve on the magazines. If I were to guess these will likely be transferred to the PNP like the Norinco CQs that China donated.